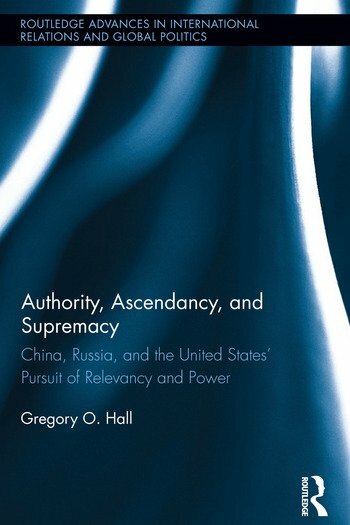 Authority, Ascendancy, and Supremacy examines the American, Chinese, and Russian (Big 3) competition for power and influence in the Post-Cold War Era. With the ascension of regional powers such as India, Iran, Brazil, and Turkey, the Big 3 dynamic is an evolving one, which cannot be ignored because of its effect to not only reshape regional security, but also control influence and power in world affairs. How does one define a "global" or "regional" power in the Post-Cold War Era? How does the relationships among the Big 3 influence regional actors? Gregory O. Hall utilizes country data from primary and secondary sources to reveal that since the early 1990s, competition for influence and power among the Big 3 has intensified and could result in armed confrontation among the major powers. He assesses the state of affairs in each country’s economic, resource, military, social/demographic, and political spheres. In addition, events data, which focuses on international interactions, facilitates identifying trends in Big 3 interactions as well as their concerns and affairs with regional players. Opinion data, drawn from policy makers, scholarly interviews, and survey research data, identifies foreign policy interests among the Big 3, as well non-Big 3 foreign policy behaviors. With its singular focus on American, Chinese, and Russian interactions, policy interests, and behaviors, Authority, Ascendancy, and Supremacy represents a significant contribution for understanding and managing Post-Cold War conflicts and promises to be an important book. Part I: The Theoretical and Historical Foundations of the Tripolar Conflict, Cooperation, and Competition Framework. 1. The Tripolar Conflict, Cooperation, and Competition (TC3) Order. 2. International Theories and Concepts: Why Authority, Ascendancy, and Supremacy Works. 3. The Cold War Bipolar International System and the Evolution of the Strategic Triangle Part II: The Evolving Strategic Triangle in the Post-Cold War Period 4. The Role and Function of Authority, Ascendancy, and Supremacy on the Contemporary World Stage 5. The China Factor in the Triangular Politics of the Post–Cold War Period 6. The Russia Factor in the Triangular Politics of the Post–Cold War Period. 7. The United States and the Triangular Politics of the Post–Cold War Period. 8. Who’s in the Triangle? Important Actors and Issues for the Big3 Powers Part III: The Strategic Triangle and the Future. 9. Conclusion: Whither the Politics of the Strategic Triangle? Gregory O. Hall completed his Ph.D. in Political Science, with a concentration in International Relations from Howard University. He currently serves as Director of the International Studies Program at Morehouse College. Dr. Hall has held appointments at several institutions, to include Hong Kong and Turkey, and, he was a 1997 Fulbright Fellow in Kazan, Russia. Dr. Hall is author of several articles, and is co-editor of and contributor to the book, Eternal Colonialism (University Press of America, Inc., 2010). "All the talk about U.S. hegemony and the rise of China sometimes blinds us to the fact that Russia is still a significant player in global affairs. Hall’s book aptly puts Russia back into the equation by analyzing the changes and continuity as well as cooperation and rivalry in the relationship among the United States, Russia and China. As world powers with real influence to exercise over other countries, how they interact with one another will determine the destiny of the world." "Professor Hall's panoramic study of the post-Cold War international system reveals the enduring power of the Big 3—the United States, China and Russia—and their unparalleled impact on contemporary world politics. It's thoroughly researched, balanced, and conceptually enlightening." "Gregory Hall professionally and consequentially examines a unique ‘political triangle’ of interactions between three impressive powers. Chinese economic growth that could have been impossible without the U.S. market along with Russian natural resources that have a potential to become a driving power for further world development – makes the issue of cooperation between the three nations vitally important for the whole humanity. This book is a real breakthrough and key for an intrinsical understanding of the processes that will definitely have a global impact during next couple of decades." "Hall provides a useful perspective on the relations of the three states. Summing Up: Recommended. General readers and undergraduate students." "For the national security community, Hall’s work represents an important translation of international relations theory to the realm of practical policy making."